Tokyo, July 2, 2013 – Subaru Tecnica International Inc. (STI)*1 today announced the release of the Subaru "WRX STI tS TYPE RA" which goes on sale on July 2 through Subaru dealerships in Japan. 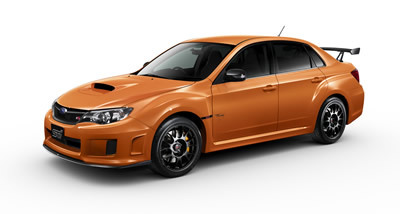 With a focus on suspension tuning, the exclusively-made items for this special performance edition have also been adopted for its exterior and interior designs based on the 4-door WRX STI spec C. To further enhance the "strength and nimbleness" driving committed by STI, its advanced driving performance such as sharper handling response has been pursued. A quick steering gearbox (steering gear ratio 11:1), "Brembo" front monoblock opposed 6-pot brake calipers and grooved disc rotors have been employed to achieve driving performance as the "TYPE RA" model focusing on a record-breaking lap time in motorsports. By the tuning of chassis and body performance combined with STI's unique flexible parts, basic vehicle attributes such as "running", "turning" and "stopping" have been balanced at a high level, providing a driver with sheer handling pleasure. The "Tangerine Orange Pearl" exterior color available for a limited time has been adopted along with the exclusively-made exterior parts such as a "tS" ornament. The body color makes a contrast with the black colored door mirror cover, side garnish and aluminum wheel. Together they create a sharp image appropriate for a high performance model. In addition, "NBR CHALLENGE PACKAGE" model which evokes the Nürburgring 24-Hour Race is released. It features special equipments such as a STI designed dry carbon rear spoiler, "BBS" designed 18-inch forged aluminum wheels and "Recaro" designed front bucket seat*2 with Alcantara®*3. *1: Subaru Tecnica International Inc. (STI), a wholly owned subsidiary of FHI, is based in Mitaka city in Tokyo. The company manages motorsport activities of Subaru. The company's president is Hiroyuki Karamatsu. *3: Alcantara® is the registered trademark of Alcantara S.p.A.